Today Ohakea put on a fantastic airshow to celebrate the 75th Anniversary with plenty of old warbirds on show along with our new helicopters and some awesome overseas guests. When I first rolled up (nice and early) I strolled along the flight line snapping away and then joined the crowd to get up close and personal with one of two C-17's that the USAF had brought over. This was really an unexpected highlight and it was fantastic to be able look through the plan and even climb up into the cockpit for a nosey. Then there was another highlight courtesy of the Aussies - a quartet of F-18's! Truly awesome and the loudest, fastest things in action - fantastic! The aerial displays were all good but our guys in our new (and old) choppers really put on a good show. Fantastic to see both the Navy and Airforce showing off for the crowd. Unfortunately I ran both my camera batteries out before NH90 did it's display. This weekend Mark, Shelley and I had a quick overnight trip to the Bay to help celebrate Mark's brother's (Clinton) 40th birthday. North of Danniverke we turned off to take in Ormonville and Takapau before cruising up through Waipuk and Waipawa. 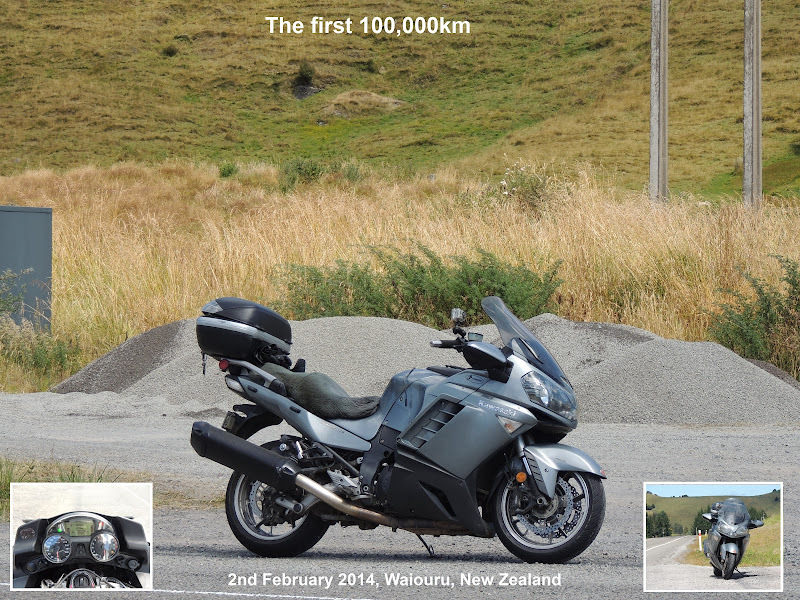 In Waipawa Mark turned off SH2 again and we got to take in Middle Road to Havelock North - always a great little ride. From there it was just a short ride to my folks place where I was forced to have a fantastic gurnad dinner before heading out for the party. Yes, in my seemingly never ending bid to keep the motorcycle accessory industry afloat the Connie has a new farkle - a set of helmet locks. Brian has had this farkle on his Connie for a while and after borrowing his spare lock on the TT I decided that it was time I got some too. The lock kit comes from Projekt D where my GPS mount, screen and hugger have also come from and as usual they were a good crowd to deal with and the locks got here in under two weeks preceded by emailed instructions on how to fit them - nice. The kit came with everything needed to install it and no less than four keys for the locks. I'd look to go into fantastic detail on how to install the locks but I'd have to exaggerate - it couldn't have been easier. All I had to do was remove my top box rack, slip the lock underneath and add a couple of washers on the front end of the rack (to keep it looking nice and level) and then bolt the plate back on. Simple! All done! Now when's the next trip? Trobairitz posted up another Blog challenge - posting a webcam piccy of yourself. Well, I can at least say I tried - look what my cam produced! Yesterday as I was driving in the car to work a womble in a POS Commodore pulled out of a business's driveway and attempted to steal my particular piece of the road. 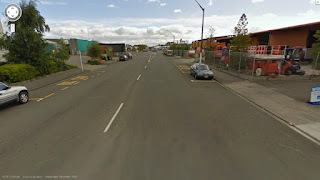 I ended up actually having to swerve - something I don't like to do as who knows where you're heading when you do that - if I had simply braked I would still have worn a Commodore. Fast forward to today and I rode to work on the DL. Riding down the same road I spotted a small red shopping trolley getting ready to pull out of another business. After the previous day's adventure I buttoned off and prepared to have to get out of the way. Sure enough, the driver just kept on coming. I easily avoided her and was able to give the Stebel a good ole workout! The driver immediately pulled off to the left and as I rode off I could see her cringing in her seat - I think she thought a Kenworth was about to park on her! Love my Stebel - hate morons in cars! Had this linkee sent to me by the TT organisers. It's a slideshow featuring pictures taken by riders during the ride at the various checkpoints etc. Our team even make it on there a few times. Good stuff. Well worth it I reckon - I had a ball! Before the TT2000 I finally got around to installing a farkle that had been sitting on the bench for quite a while. It is a GPS mount from Projekt D that offers a bit more secure mounting than the original RAM setup I had. I have nothing against RAM mounts - they are very good (especially for cameras) for mounting things in different positions and offer a lot of flexibility. But if you look at the picture below you can see that there is a single allen bolt holding an expanding rubber inside the steering stem and this does loosen off after time. The mount is also prone to vibration occasionally. Now, the reason I hadn't installed the mount previously was that I had tried to undo some of the big allen bolts holding the handle bars on but just couldn't budge them. I decided that it was better to stop and wait until I could get some help or better tools rather than risk rounding off the allen heads. Suffice it to say but the new mount is a whole lot more rigid and secure than the old setup and after bending it slightly to get a nice angle (and so the glove box can be opened) the mount is perfect! On the trip I never noticed any vibration and everything looks like it came from the factory like it...neato! Trobairitz asked the other day if I had any pictures of the animals from Orana Park and there are some here but I also got some shaky video from my little digital camera of the Siamang Gibbons and the Meerkats. The gibbons were fantastic and were really going off when we got there. They can make a heck of a racket and were really giving it heaps - very hard case! not long after their little show they'd obviously worn each other out and went and hit the hay - I'm glad we got to see them in action. The Meerkats were very industrious little chaps and when I saw the guy on the video start digging I had to get that on video too. I got an email last night that has confirmed that the three musketeers successfully completed the TT2000 so that badge is on it's way - wahoo! In the meantime I've been mucking around in GoogleMaps and can now share the route that we took. The maps are pretty accurate as I used GPS co-ordinates for the checkpoints - the only one that is not accurate is the Rainbow station one as GoogleMaps does not believe you can ride a bike to the checkpoint...Clicking on the little green bikes brings up the photo I took at that checkpoint.